A beautiful summerhouse in the corner of any garden will be both a feature and also a valuable extra room for entertaining or relaxing. The new British made Arlington Corner Summerhouse from Forest Garden is the perfect answer and we have one to give away, worth £819.99 for one lucky winner. 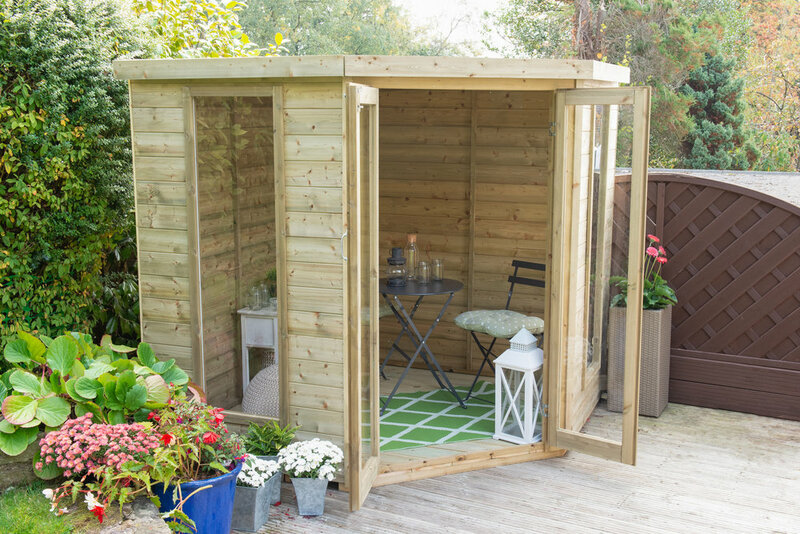 Produced using FCS certified, pressure treated tongue & groove timber, the Arlington Corner Summerhouse is made from smooth-planed interlocking board. It carries a 15-year guarantee against rot. It has two full length acrylic windows and double doors ensuring maximum light, what ever the season or weather. It measures 7ft x 7ft. The roof is constructed from pressure treated tongue & groove interlocking timber board covered with black mineral felt and the floor is also pressure treated tongue & groove interlocking board. Forest Garden is the UK’s largest manufacturer and distributor of timber garden products. The company specialises in fence panels, garden sheds, gazebos, greenhouses and summerhouses as well as other decorative timber garden products. The Arlington Corner Summerhouse is manufactured at its Hartlebury site in rural Worcestershire and all the timber used by the company, the majority of which is British grown, is FSC certified. To view the full terms & conditions click here.